I discovered your blog site early this summer. First off, I wanted to thank you for taking the time to write such wonderful and informative articles on your blog. I have learned a great deal from reading your articles and look forward for the new ones each day. Ever since encountering your site I have been paying more attention to the subtle details of my wardrobe and have gone through a process that includes tailoring articles of clothing I already have, slowing acquiring new articles of clothing, and purging articles of clothing that do not suit me anymore. My wife thinks I’m a bit crazy but I always like to believe that in whatever you do you should put your best foot forward and pay attention to the little details, and reading your articles has helped and is still helping me to do so. Thank you for that. Now to the question at hand. The other day while watching one of my favourite movies, “Indiana Jones and the Raiders of the Lost Ark”, with Harrison Ford, I noticed one of the suit jackets that he was wearing seemed to have a ‘band’ sewn into the back of the jacket just above the waist (see image). The image was taken directly from the movie at 17′:03″. I also noticed this detail on another character’s suit jacket, where the jacket was all white. The movie takes place pre-WWII so I figure mid-1930’s. I have never seen this detail on a jacket before but I was curious as to its history if any. I did some preliminary research on it but could not come up with anything substantial. I figure I would try asking you given your wealth of knowledge on the subject. Thank you for your kind email, and I’m pleased you enjoy the blog. It sounds like you have set out on a journey that will be very rewarding in years to come. The jacket in that picture has a half belt. This harks back to military jackets and coats that had a functioning belt all the way around the waist. You can see the real version today in trench coats and similar overcoats. Many jackets retained the detail of the belt, merely as a decorative item, as it gives greater focus to the waist. It is simply a strip of self cloth sewn across the waist. ‘Sports’ jackets still have that detail – you will see it on safari jackets and hunting jackets, for example. The Huntsman shooting suit I have written about here has one. The other advantage to a half belt is that it allows the tailor to build in pleats easily between the belt and shoulders, as your image shows here (though that also requires a different shoulder pattern to a normal suit). 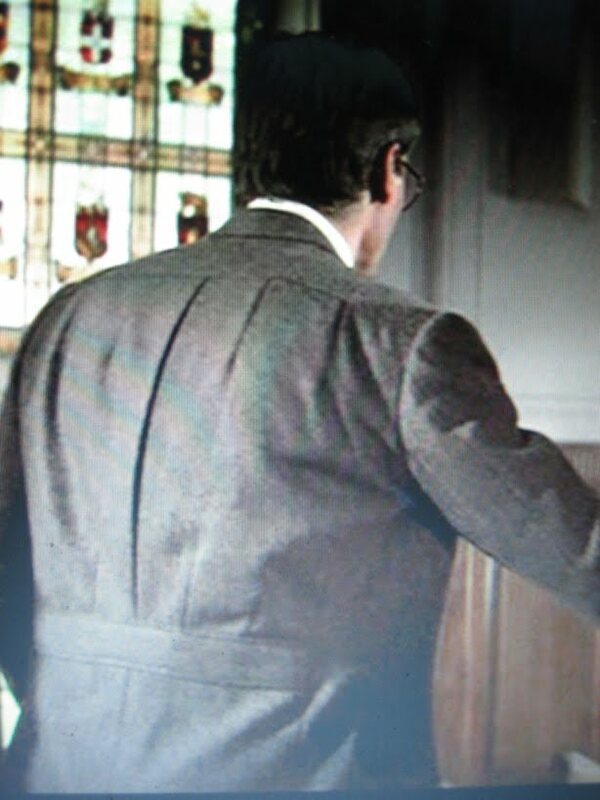 Again, sports jackets often had pleats built into the back in this way in order to help the wearer move his arms, whether shooting or playing tennis. If you want to incorporate a similar design detail on a jacket yourself, I would recommend taking a picture to your tailor and making clear what you want in terms of pleats – one central, two at the sides or multiple, as the jacket has here. I would suggest having it in an odd jacket rather than a suit, however. You can follow the discussion on Reader question: Indiana Jones by entering your email address in the box below. You will then receive an email every time a new comment is added. These will also contain a link to a page where you can stop the alerts, and remove all of your related data from the site. You may oftenly witness half belts on tweed jackets – they are frequent on english countryware ; The traditionnal half belted tweed jacket is a “half norfolk jacket”. Thanks for that explanation. Its interesting to see how some functional details over the years slowly become more decorative details. I actually like this detail for a sports jacket. I have a Norfolk Jacket from Gieves and Hawkes that I picked up second-hand but possibly unworn on eboy that has the same type of pleated back and half-belt. I’d have to rewatch Raiders, but I’d love to look at it with a new eye. If it’s tweed and has bellows pockets, a half-belt, and a pleated back I’d call it a Norfolk. If it’s got flapped pockets and no other details, it makes for an interesting hybrid. Thank you for this article. Even though the cut might not be ideal, I really like the idea of the double-breasted jacket in the second look. Do you happen to know what fabric it is made in? Also, what do you define as “Fresco”?